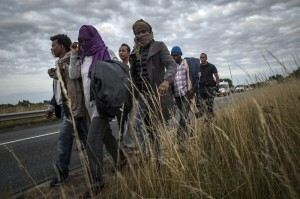 A global migrant crisis finally strikes the continent. This has been the year of the migrant in Europe. The refugees come from Syria, from across Africa, from Afghanistan and other places. About 137,000 asylum seekers have arrived in the first half of 2015 alone–an 83% increase from the same period last year. As a crisis, this one has many dimensions. On the surface, it’s an immigration problem. The U.K. and other European countries say they need to be able to limit the unprecedented flow of migrants or they risk overwhelming their fragile economies. But an increasingly fractured E.U. has been unable to come up with a concerted response to what is the biggest refugee crisis since the end of World War II, with some 60 million people displaced by conflict and grinding poverty. That political failure has turned an immigration crisis into a humanitarian one. More than 2,600 people have died this year trying to make the journey to the continent’s shores, turning the Mediterranean into the most dangerous border crossing in the world. In April, European leaders agreed to triple funding for coast guards and helicopters in the area, but hundreds continue to die on Europe’s doorstep: 200 people drowned on Aug. 5 when a boat stuffed with migrants capsized near the Libyan coast. Some of those 60 million displaced people have fled their homes out of desperation because of conflicts like the Syrian civil war; others are seeking a better life in richer countries. And thanks to European principles of free movement, migrants who break through the E.U.’s external borders can move freely within it once they’ve landed. At least until they reach Calais, where about 3,000 migrants are now blocked by Britain’s oldest border defense, the English Channel. In the past, migrants often tried to make the passage by stowing away in trucks that crossed the sea by ferry. With increased security around the port, the focus has shifted recently to the undersea Channel Tunnel, where migrants try to hide on freight trains and Eurotunnel shuttles carrying vehicles. The Jungle, as the dusty migrant encampments on the edge of Calais are known, has become a snapshot of the conflicts raging beyond Europe’s borders, sheltering hundreds of Syrians, Sudanese, Eritreans and Afghans. Though the Jungle sprang up without approval, it has evolved into a semi-permanent slum that falls far below international humanitarian standards. While political ties across Europe have been strained by the migrant crisis, the gulf between the U.K. and its continental neighbors has particularly widened. Despite the tabloid outrage, Britain actually receives fewer asylum applications per head of population than the E.U. average, and Germany, France, Sweden and Italy all receive far more claims than the U.K. “We must push the British government to take its share of responsibility,” says Emmanuel Agius, the deputy mayor of Calais. While nearly 1 in 8 U.K. residents is foreign-born, migrants who reach Britain rarely receive a warm welcome. Some migrants wearily accept that they will be in Calais longer than they would like: bored of borders, reads a sign outside one tent. In the Jungle, you can now get a haircut, have your bike fixed, even pray in an improvised mosque or church. Some enterprising residents stock up on goods in supermarkets in town, hawking them for a profit back in the Jungle. There are over a dozen pop-up shops, selling everything from cell-phone SIM cards and cigarettes to whiskey, Red Bull and Coca-Cola. At night, people dance to Michael Jackson songs under a disco ball in a makeshift club.